Hawaiians have held the Waimea Valley as a sacred spot for more than 700 years. One of the last partially-intact ahupuaa in Hawaii, the Waimea Valley now hosts an incredible botanical garden, historical sites, and the famed Waimea Falls. 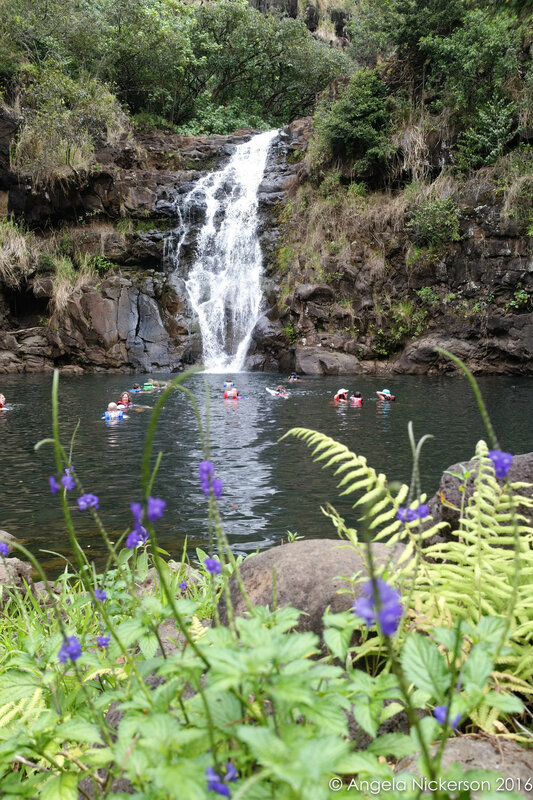 Spreading over 1875 acres, the valley offers a peek into the lush vegetation which once spread over much of Oahu. When we bought our tickets, we also received a guide which included two dozen or so types of birds to look for on our hike. Bambino had a great time hunting for them, and despite his noisy nature, he spied nearly a dozen different types on our visit. Here you can see orchids growing in the wild -- they really do exist outside of pots at Trader Joe's! The gardens are staffed with an army of volunteers who lead demonstrations and are full of fascinating information about the historical sites in the Valley as well as Hawaiian culture and history. We played musical instruments and an ancient Hawaiian game. And sadly we just missed a hula class. Truly, this is a magical place -- and it is a much more accurate and historically sensitive place to visit than many of the local attractions including the near-by Polynesian Cultural Center. For our family, the highlight was swimming in the Falls. It was brisk but beautiful. Life jackets are required and are provided. There is an area to change, and a spot to leave your belongings, but you can not secure them. And the path into the Falls is rocky, so water shoes are essential. The path is up a fairly steep hill going toward the Falls -- and downhill on the way back (1.5 miles round trip). For those with mobility issues, there is a golf cart (for an extra fee).